Official synopsis: "Tim Macbeth is a 17-year-old albino and a recent transfer to the prestigious Irving School, where the motto is, “Enter here to be and find a friend.” Tim does not expect to find a friend; all he really wants to do is escape his senior year unnoticed. Despite his efforts to blend into the background, he finds himself falling for the quintessential “it” girl, Vanessa Sheller, girlfriend of Irving’s most popular boy. To Tim’s surprise, Vanessa is into him, too, and she can kiss her social status goodbye if anyone finds out. Tim and Vanessa enter into a clandestine relationship, but looming over them is the Tragedy Paper, Irving’s version of a senior year thesis, assigned by the school’s least forgiving teacher. The story unfolds from two alternating viewpoints: Tim, the tragic, love-struck figure, and Duncan, a current senior, who uncovers the truth behind Tim and Vanessa’s story and will consequently produce the greatest Tragedy Paper in Irving’s history"
Ugh. I don't even know where to start. I wanted to love this book so much. When I first heard about it I was so excited. I loved the premise. I loved the cover - it just made me want to dive in - and when I got a copy I did a little dance and couldn't wait to read it. But then I did start to read it - and it was not what I expected at all. One thing this book has taught me is not to make expectations so high. Whilst I did enjoy the book, it isn't terrible, far from it, I just didn't like it as much as I thought I would. I would find myself sometimes becoming disinterested with parts and just stopping altogether only to come back later and have to re-read because I had missed things. I don't know what it is, I don't know why but I just couldn't seem to focus on some of the book. 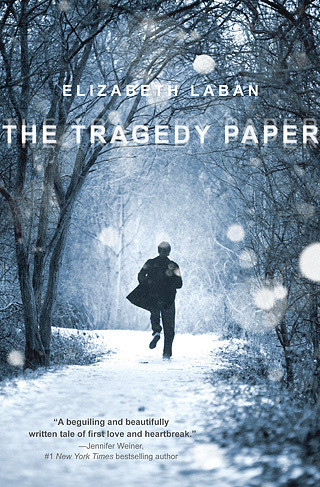 At first, the idea of the Tragedy Paper itself sounded interesting, but it failed to capture me - the book became too much about education and school and I think that's what turned me off a bit. Everyone seems to excited about it - they look forward to this paper and learning in general. Now call my cynical, but I don't know that many people that actually enjoy school that much. I didn't exactly hate school but nor did I love it - I don't know if this is what irked me about the book or not - it's something I can't put my finger on if I'm honest. Tim is an albino, and this interested me. It was one of the reasons I wanted to read the book - it's different. In a world of vampires and perfection and God knows what else is out there on bookshelves it made a nice change and I was looking forward to probably learning something but all I really garnered was that Tim's eyes caused him a lot of grief. I felt for him when he said about people staring - I for one hate big crowds and being looked at so I got where he was coming from - but the relationship with Vanessa was a lukewarm one for me. I don't know what else to say on this point without spoiling the book - I know there will be people out there that will find it cute, lovely, but I am just not one of those people I guess. I liked the idea of the CD's Tim left behind for Duncan, the next occupant of his room - a tradition is that the past Seniors leave a gift behind for the person who gets their room for the next year and this was interesting - and them telling his story. The writing is great - fluid and engaging. It's just the plot that lets the book down for me. I hate writing reviews like this one. Like I said, I wanted to love this book. But I do pride myself on my reviews being honest. It's a sad fact in life that some books are not for everyone, and this is just one of those books for me, I guess. It is contemporary and it could just be that I don't read many books in the genre so don't get on with them so well. That said I know there will be people out there that adore this, and rightfully so. Please don't be put off reading it, I just have to give my honest reading experience. I've seen all the buzz, all the excitement and lots of awesome reviews for this book so I know folks are loving it so definitely check it out and make your own mind up! Would just like to say thank you so much to Harriet at Doubleday for my copy! You rock!